Hen-keeping is an incredibly rewarding experience and ex-commercial hens are ideal for beginners. Here are the basics you need to get started. Keepers can buy a purpose-built hen house or convert an ordinary shed/outbuilding. Housing must be completely fox-proof and vermin-proof. We advise you buy a house which can accommodate more birds than you intend to get, so if you want 3 hens buy a house that can accommodate at least 4. A hen house needs a nest box facility and perching. Hens can be kept in a smaller house with a run or a larger aviary-type enclosure. Plastic coops can be easier to clean and may reduce the likelihood of red mites. To keep the ground dry put a layer of wood chippings around the hen house entrance. Position the hen house so that the hens have protection from prevailing winds and shelter from the sun. The more space and enrichment available to the hens, the happier they will be. Droppings and wet patches should be removed daily. We recommend a thorough clean-out be carried out every two-four weeks depending on flock size. A thorough clean is also an opportunity to disinfect or treat for red mite. The average adult hen needs 100-120g of feed per day. We recommend layers crumble and mixed corn – our ‘Thank You for Adopting Me‘ bundle is perfect for first time hen keepers. Ideally fresh food should be put out daily. Control the amount of feed and tailor it to the number of hens in your flock. Do not let food go stale or get damp. If hens are fed outside use a sturdy feeder to prevent it being knocked over and clear up any spillage to avoid attracting vermin. It is illegal to feed your hens kitchen scraps unless from a vegan household. 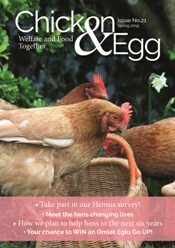 Hens thrive on a well-balanced diet and should only be given nutritional treats specifically designed for hens such as Hentastic. Too many treats can disrupt egg production and affect shell quality. Hens can become overweight with too many treats. You can ration treats using treat dispensers such as Peck-It Treat Dispenser. Hens need daily care and aren’t the kind of pet that can be left for a couple of days unattended. They like routine so keepers should establish this from day one. Stick to the same feed times and avoid sudden changes to their environment. Hens like staying out until late dusk so plan to be there to shut them in. Routine worming should be carried out three or four times a year using a licensed product. Hens should be active and alert, not huddled with fluffed up feathers or eyes closed. Droppings should be firm and dark brown with a white urate cap. 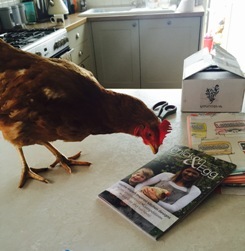 You can read through our hen examination guidelines if you would like more information.